If you are using MS Outlook to manage office and personal contacts then isn't cool if you can put faces on these contacts? 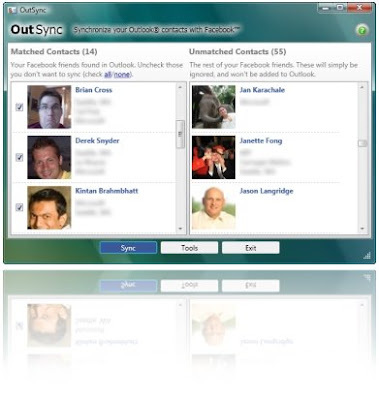 OutSync can find your contacts who are listed in your Outlook address book and are also connected with you on Facebook. It can automatically update the photo of each contact in your MS Outlook with the latest profile picture of then on Facebook. The app is more beneficial if your using Windows Mobile then contacts are automatically updated by Exchange server or ActiveSync. Now everytime a synced contact calls you, a photo will appear. OutSync supports Windows XP, Vista and Server 2003. It requires Outlook 2003 or 2007. To install OutSync, just follow the setup instruction here. Download OutSync to synchronize your Facebook friends photos and Outlook Contacts.